Rarely does an opportunity to own an architecturally significant home arise. 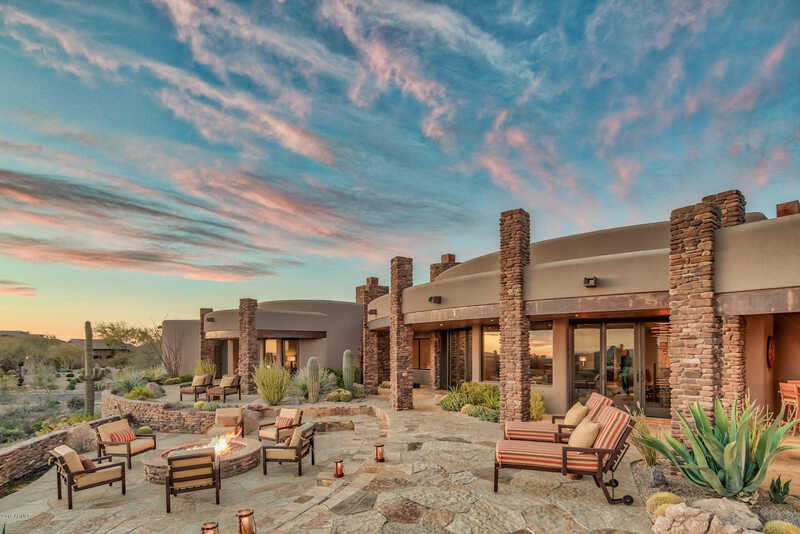 Designed by Terry Kilbane, Sun-to-Sun is offered with custom furnishings & artwork complementing the home’s organic pueblo style. Situated on 2 lots on the 7th fairway of Mirabel’s golf course, only 50% of the building envelope is used. Protected views provide breathtaking sunrises, sunsets & city light views from an outdoor heated cantina or fire pit. The gourmet Miele kitchen accommodates multiple chefs creating memorable meals by one of the home’s 6 kiva fireplaces. The master boasts a large fireplace, walk-in closet, luxurious bath, & private view patio. Contemporary artisan finishes, smart home technology, & unparalleled build quality make this open home unmatched. Includes golf membership at Mirabel Club. Directions: From the intersection of Pima to Cave Creek Road, head East 2.3 Miles – Turn Right (South) and proceed to Security guard for directions to the home. This is the only gate you can enter from. Approximate size: 76045.00 sq. ft.
HOA name: Mirabel Comm. Assn. Please, send me more information on this property: MLS# 5875615 – $3,350,000 – 10963 E Winter Sun Drive, Scottsdale, AZ 85262. I would like to schedule a private showing for this property: MLS# 5875615 – $3,350,000 – 10963 E Winter Sun Drive, Scottsdale, AZ 85262.